Classic styling and traditional shapes combine to make the Hartman Amalfi Cast Aluminium collection a great choice for any garden. The Hartman Cast aluminium collection is unique and distinctive and completely maintenance free. If you favour a more traditional look then try the stylised design and organic flowing lines of the Hartman Amalfi garden furniture range. The Amalfi is available in traditional bronze or a brand new colourway, Sahara. Sahara is a soft shade that completely transforms the look of the furniture bringing out the detail on the table and chairs. The new natural shade is enhanced by luxury padded cushions with piped edging in Hartman all new sienna fabric. Hartman is a Netherlands based global brand with offices in Belgium, Germany, the Czech Republic, as well as in the UK. Their products are available throughout the UK, including in our own Dawson's Department Store in Clitheroe. 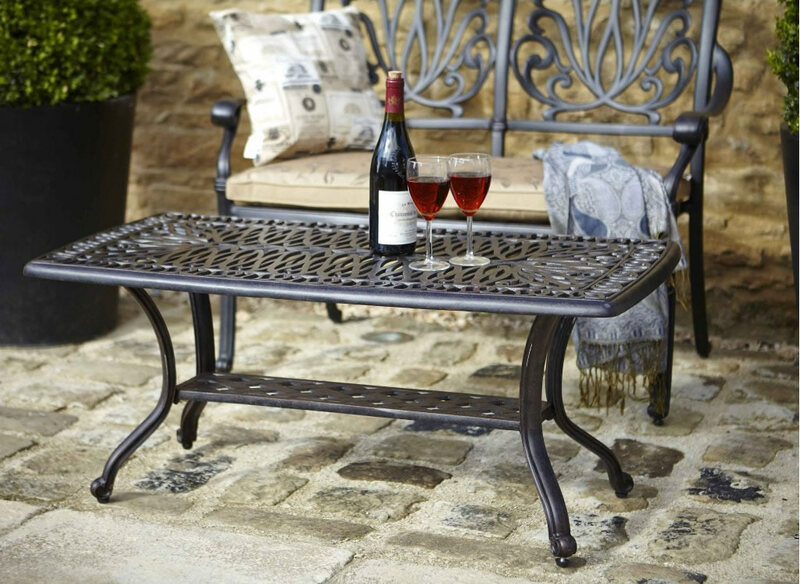 The Amalfi range of furniture is a great looking, attractive, and durable range of cast aluminium garden furniture. It has a classic, traditional look, has been produced so that it better withstands winter temperatures and wet months, as well as the potentially damaging UV rays produced by the sun. it is durable and tough, and the Hartman Amalfi garden furniture range includes bistro and dining sets, as well as items like benches, loungers, and additional tables and chairs. 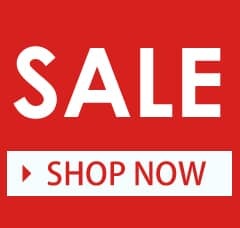 Browse our website and buy through our online ordering system, call and speak to one of the team with any questions you have about our products or, alternatively, call in to Dawson's Department Store in Clitheroe where you can browse our entire range of homeware including Amalfi furniture from Hartman and other garden and conservatory furniture ranges. We offer free delivery on all orders over £50, which means that you can have your furniture delivered free of charge to any mainland UK address. Hartman has its global headquarters in Enschede in the Netherlands, but they have become a global brand with offices in countries across the world. Their UK headquarters is found in Telford, Shropshire, and the company manufactures an extensive range of weave, hardwood, aluminium, and, of course, cast aluminium furniture. The company has become synonymous with the production of high quality outdoor furniture and, as a result, they have also partnered with celebrities including the likes of Jamie Oliver to create unique ranges and styles of furniture. 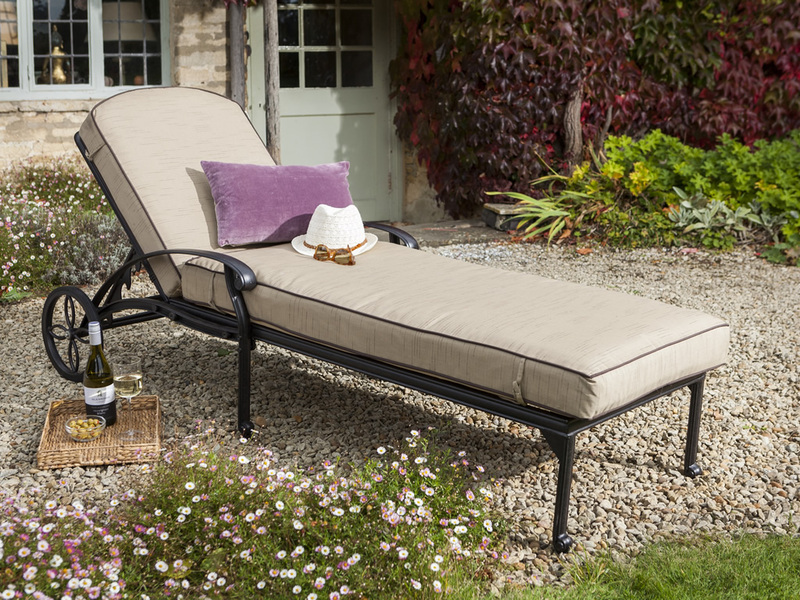 The Amalfi garden furniture range has flowing lines and classic curves. The detail on table tops and on chair legs, as well as on other items of furniture really give a sense of style to this collection. At GardenFurnitureWorld we hold a large selection of Amalfi furniture so that you can create the furniture range and the outdooring dining or relaxation area that you want. 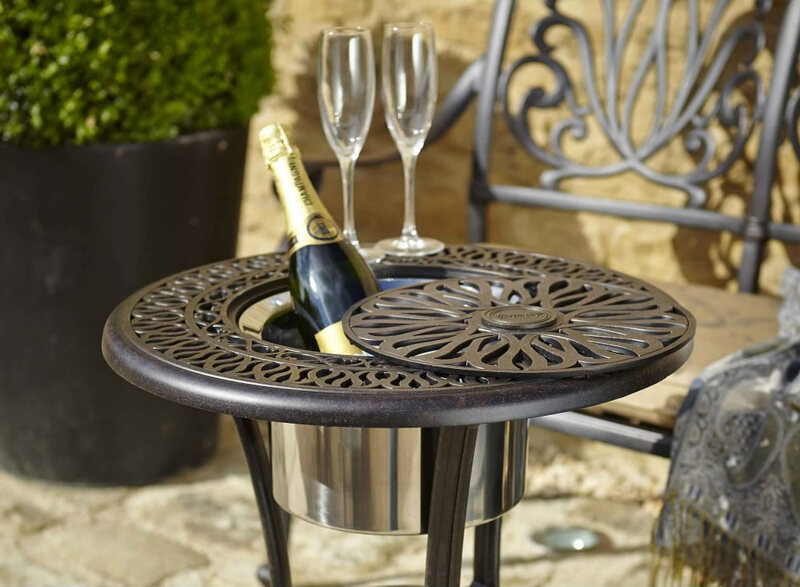 Cast iron is the traditional metal of choice for creating garden furniture. It is created to withstand rust and be durable, but while it lasts better than other types of iron and metal, it is still prone to rust. This is why Hartman, as well as other furniture manufacturers, use cast aluminium instead. Cast aluminium will not rust but can be cast so that it has the same appearance and the same great looks as that of cast iron. Despite the appearance, however, it won't corrode, and it is much lighter than the cumbersome cast iron furniture options of yesteryear. Cast aluminium is strong and durable, despite being light. Because it is cast into shape rather than bent or welded, it has fewer joints and fewer weak spots to become damaged. This also means that there are fewer screws, bolts, and other fastenings, which are prone to damage when left out in the winter and the rain. A bistro set is a small garden or patio furniture set that is designed for two people. As well as two dining chairs, these sets also incorporate a small table. Bistro sets usually include a round table, because these make conversation easier around the table, and they offer the most amount of table space with only a small footprint. The bistro sets, like a lot of the Hartman Amalfi garden furniture sets, are available in bronze, maize, or Sahara sand colour. The chairs include a comfortable cushion that offers a warmer seat than sitting directly on cast aluminium. The cushions are designed to be added to and removed from the chair quickly and conveniently. They are easy to clean and simple to maintain, too, which means that they are the ideal addition to a garden furniture set. For those that require more space when eating, or if you have a larger family than just the two of you, there are Hartman Amalfi dining sets. 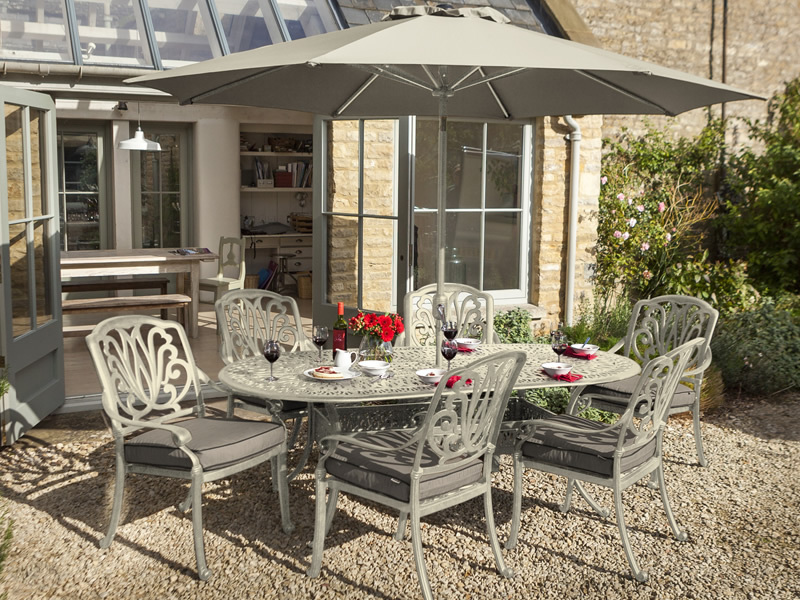 Dining sets include 4, 6, or even 8 cast aluminium seats with cushions, a choice of table sizes and designs, and there is also the option of sets that include parasols or those without. The dining sets come in the same great range of colours, and they are just as easy to maintain as the bistro sets. The furniture can be left outside when not in use, all year round. It is advised that you take cushions indoors when not in use, although some of the sets include Hartman's WeatherReady cushions which are designed to better withstand adverse weather conditions. The chairs will stack easily so that they can be stored, while tables include adjustable feet so that the chairs will rest on any uneven surface, which includes a lot of patios and gardens. When buying a Hartman Amalfi garden furniture set, you have the option of buying a set that includes parasols, or sets that do not include one. A parasol is a great way to protect diners from the sun and they can even protect against light showers; essential for British summers, and can also protect food and help it keep longer when you barbecue. Buying a parasol that is designed specifically for use with a particular dining set means that it should protect the full area of the table, and it means that any parasol hole in the middle of the table is designed for use with that parasol. 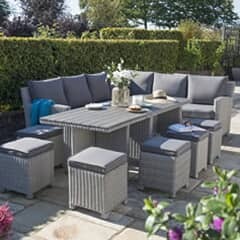 As well as selling Amalfi garden furniture sets, we also stock a selection of great quality individual items. An armchair is a dining chair with cast aluminium arms, and includes a cushion to provide a more comfortable sitting position. Buy additional side tables, or buy cast aluminium coffee tables that will perfectly match the look and style of your dining set or lounge set. Amalfi garden benches offer seating for two, and they can make a great addition when placed under the shade of a large garden tree. These also include WeatherReady cushions. They come in a choice of bronze seat with fawn cushions or maize seat with taupe cushion. Another seating option that includes the same great looking, traditional design, is the Hartman Amalfi lounger chair. This reclining chair is ideal for balmy summer days, providing somewhere comfortable to sit anywhere in the garden. 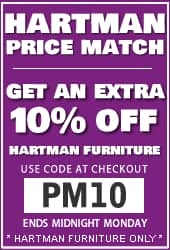 Hartman is a well-established garden furniture manufacturing company. 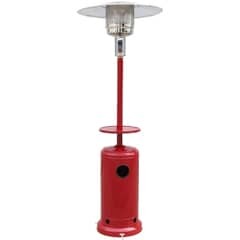 They are made from cast aluminium, rather than cast iron or standard aluminium. They are durable, they do not rust, and they have a traditional outdoor link that would look in almost any garden. The only maintenance and care you need is to give the furniture a wipe with a damp cloth. Cushions can be removed and placed indoors during the winter, although the furniture itself can be left out throughout the winter months, but is light enough that it can be carried indoors. Hartman Amalfi furniture has been designed for use in the garden, on the patio, or on the decking. The range includes bistro and dining sets, as well as individual table and seating options like loungers and even coffee tables and side tables. Colour options include the traditional bronze colour, as well as the softer Sahara sand colour. At GardenFurnitureWorld we have a large selection of garden furniture from major brands including the likes of Kettler and Amalfi. Buy directly using our secure online system, call us with questions about specific products, or call in to Dawson's Department Store in Clitheroe where you will be able to view the entire homeware range that we have to offer. Don't forget that we also offer free delivery on all orders over £50 so you can enjoy free and quick access to the new garden furniture sets that you want.